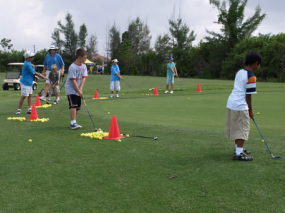 Newly created junior golf programs are eligible to receive grant funding. However, newly created programs without a proven track record in junior golf will generally receive lesser grant awards in the early years of their program. Additionally, new programs should study the level of junior golf activity in their area to avoid a duplication of efforts. Local Support - New programs should not look to the FJGC as their sole means of support and should develop other revenue sources including user fees, local support from community-based organizations, local businesses, golf clubs, and men's and women's golf associations found at local golf clubs. If your program is worthy, the local community and local golfers will lend their support.